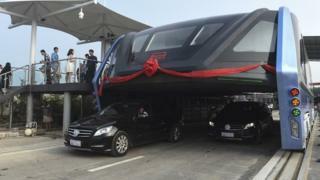 Image caption The firm behind the bus says what was called a "road test" was just an "internal test"
Last week, a futuristic traffic-straddling bus, raised over the road so cars can drive underneath, was road-tested in China. There was great excitement about this possible solution to traffic woes, but questions are now being asked about whether the project is feasible or even real. The idea of a traffic-straddling bus first appeared in China in 2010, but it did not make much impact until the model was presented at the Beijing International High-Tech Expo this year as a solution to traffic congestion. The Transit Elevated Bus, dubbed Batie, was described as a revolution in public ground transportation, but only a few days after its much-lauded test-run in Qinhuangdao city, Hebei province, all test-runs have been halted and doubts have emerged. Batie stands 2m above the road, but the test run covered only 300m on a local road with just two traffic lanes. 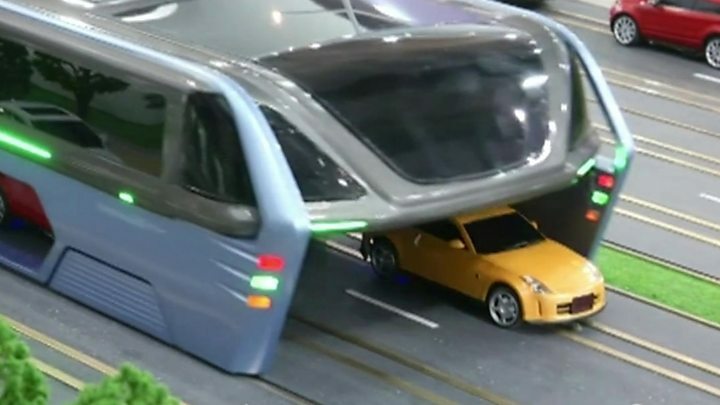 Many doubt the vehicle would fit under footbridges in Beijing, and critics have asked how it will turn corners, whether it is strong enough to bear its own and passengers' weight and how long its battery would last. Image caption The BBC went to the once busy showroom and found it shut for "repairs"
The Beijing News pointed out that the model used in the latest test run was the same one as six years ago, suggesting the project has made no real technical progress since then. And the model is far from finished as workers were still working on parts of the bus just before the test. Many people commenting online also raised Batie's "lack of real science", saying Song Youzhou, the vehicle's designer, has only a primary school education, although he owns more than 50 patents for different inventions. Mr Song says none of China's great inventions were made by university graduates. "I hate it when people make fun of inventors and enjoy the result of their hard work in the meantime," he said. Does it really have government backing? Public reports show that the company behind Batie signed a strategic partnership with the Qinhuangdao government in April, but when the Beijing News got in touch, both the Qinhuangdao and local Beidaihe governments denied any active involvement in the project, saying there was only a "skeleton" agreement. The city's top economic planning department, the National Development and Reform Commission of Qinhuangdao, was quoted as saying the bus project had not been approved. The company later clarified that the trial was not a formal "road test," but simply part of "internal testing". Batie also says it has signed contracts to co-operate with the Tianjin and Henan governments, but when Chinese journalists visited their production base in Henan, it is reported that they saw no activity inside the factory site, and that it was overrun with weeds. Mr Song has repeatedly called Batie a "major national innovation", but faced down by his critics, he has admitted that the project has not gone through the stage of officially qualifying as one yet. Mr Song also told local media that he expected 500,000 Batie to be operating worldwide eventually. He claimed to have received orders from Spain, Mexico and Argentina. "Even the French and Indian transportation ministers have come to us," he said. Will investors see their money again? The Beijing News has reported that Huaying Kailai, a once blacklisted firm now the main investor in Batie, has been selling investment packages hailing government support for the vehicle. The newspaper said that although Huaying Kailai had been blacklisted in 2015 for conducting illegal finance activities, it had since attracted 300-400 investors, who have been promised returns of 12-14% for investing a minimum of one million yuan ($150,000; £116,000). State-controlled newspaper the Global Times said Huaying Kailai was suspected of running a peer-to-peer financing scheme that promised high returns and risked running out of cash. The BBC visited a once bustling Batie showroom in Beijing, which is the same building as Huaying Kailai's offices - where potential investors in Batie used to come to receive their sales pitch. Now, the showroom is closed to visitors. Security staff told the BBC: "The sand table for the model is being repaired." The Batie vehicle itself, in Qinhuangdao, is now hidden under a steel and canvas structure 10m high, 9m wide and 30m long, Chinese media report. When the BBC called the offices of Huaying Kailai and Batie Technologies, representatives from both firms denied any relationship between the companies. However, when asked about the allegations against the company the Huaying Kalai representative said: "Yes we are still operating. You can be assured to invest with us. There is no risk." Do projects like this have a future? Meanwhile, Chinese people are still talking online about whether such inventions should be encouraged, even if many turn out to be impractical, or whether they should be discouraged or at least carry bigger warnings about the risk to investors. "This project is when a mad inventor meets a group of mad investors," one person commented. "Inventions can be about anything, but it needs to have a touch reality," said another. Mr Song shrugs off the criticism, saying Batie is to apply for 20 more patents. "Any invention will face challenges at the beginning, including the first underground train and the first airplane, but now they've all developed very well," he said. "We did not commit a crime. We are just trying to innovate. Is there anything wrong with that?"